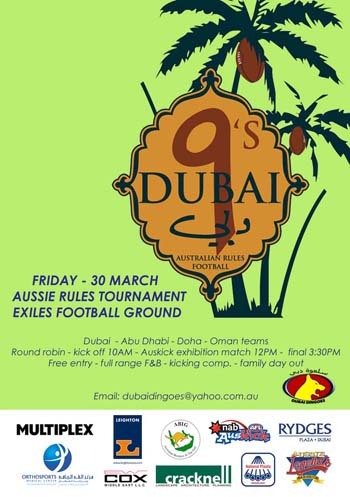 As this month’s Dubai 9s approach, ARI and the Dubai Dingoes have released the schedule for matches and other events on the day. There has also been a slight alteration to the teams that will be attending, now including five squads from around the city of Dubai, one from Doha (Qatar) and a combined squad from Oman and Abu Dhabi. Joining the Dingoes from Dubai will be the Dubai Celts, as was mentioned in WFN’s preview of the competition, the Satwa Swans (Satwa is a suburb in Dubai, and the club was coordinated through the Dingoes although the two remain separate), the Dubai Heat (predominantly Australian developers, engineers and others from the construction field) and the Airmiles Hawks (Australian expatriates, both Aussie Rules and rugby players). Also present will be the Doha Kangaroos - a newly formed footy club in Qatar, on which WFN will have a write up in the coming weeks - and Clann na hOman & Abu Dhabi United (some GAA players, but many are from an Aussie Rules background. Organiser Nigel Koch is quietly confident that this will be the framework for a football club in Abu Dhabi). Games will be played on two fields at the Exiles Rugby Ground. A juniors’ program will be held between 12.00 and 1.00 and a raffle and goal-kicking competition will be held in the fifteen minutes preceding the final. The Dingoes were kind enough to also share with us the promotional poster for the event which can be viewed above.